Few people would say that Chinese cars are the best in the world and that German cars are the worst. The quality and reliability studies certainly say otherwise. But the warranty data says Chinese companies spend the least and German companies pay the most. How to reconcile these contradictory data sets? In last week's newsletter we said there seemed to be no correlation between warranty expense rates and vehicle quality or reliability ratings. We said that even though German cars had the highest expense rates and Chinese cars the lowest, that did not mean that Chinese cars were the best, nor German cars the worst. This week, we're going to flesh that statement out a bit, by citing some of those quality and reliability statistics, and comparing them to what the warranty expense data says. Let's start with J.D. Power, which for 50 years has been polling new car owners to find out how they fared. Each year, J.D. Power a study of the problems experienced by original vehicle owners during the first 90 days of ownership. 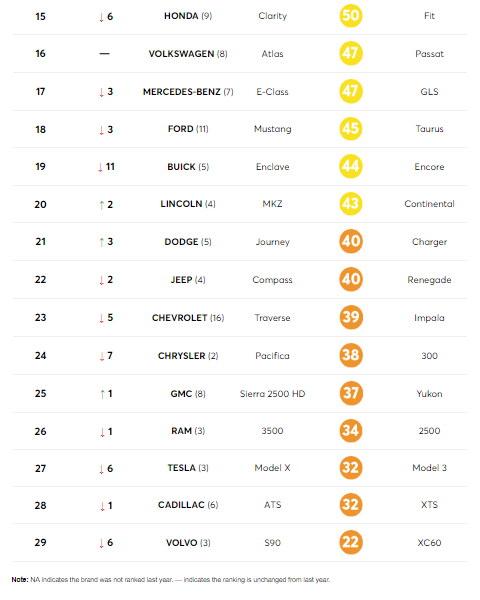 The Initial Quality Study then ranks the car brands based on the by the number of problems experienced per 100 vehicles, with a lower score reflecting higher quality. Because we're using 2017 warranty data in Figures 2 and 3 below, we took a look at the results of the 2017 U.S. Initial Quality Study. J.D. Power helpfully included a graphic in that study which organized the nameplates by headquarters country, as we did with our data. As can be seen below, in the last five years the number of incidents per 100 is down for all four regions: Europe, Japan, U.S., and South Korea. In this case, the lower the number, the better. Because few Chinese cars are sold to U.S. buyers, there was no data included for Chinese brands. And, of course, the European data also includes Fiat, Renault, PSA and Volvo, so it doesn't match up exactly to our German-only data. Because J.D. 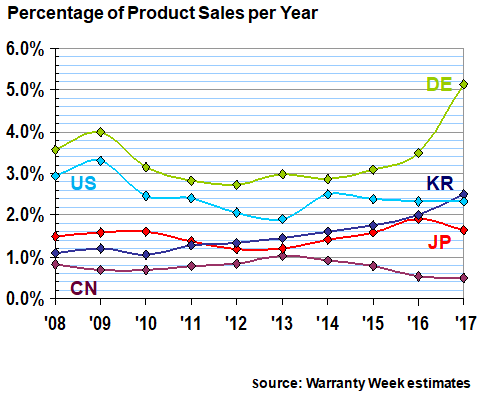 Power included Korea, we created a new set of statistics on average warranty expense rates for Hyundai and Kia. The problem is, we can't find any evidence of this decline in our charts, which are based on the reports of the manufacturers themselves with some estimates added for non-reporters. Looking just at claims rates, we see that Germany is spiking in 2017, Korea is rising, and Japan is just a bit below 2016's peak (we're time-shifting the Japanese fiscal year which ran from April 2016 to March 2017 to calendar 2016). The U.S. has remained relatively steady for the past three years, and China remains unusually low for the entire decade. The claims rate for vehicle manufacturers based in China has averaged only 0.8% for the past 10 years. The claims rate for Japan has averaged 1.5%, and the average claims rate for Korea is just a notch above 1.5%. The U.S. average claims rate is just below 2.5%, and the decade-long average claims rate for vehicle manufacturers based in Germany is 3.4%. Germany and Korea also have a higher standard deviation than the other three, which is caused by the recent rises. The standard deviation for China and Japan is lowest, which reflects the relative stability of their claims rates over the past decade. In Figure 3, we're looking at the accrual rates of the automakers based in the five countries. Once again, China is the lowest and Germany is the highest. However, with this metric the decade-long average for Japan is slightly above 1.8% while the average for Korea is slightly below 1.8%. The U.S. is at 2.1%, and Germany is at 4.2%. Once again, Germany and Korea have the highest standard deviations, caused by the recent increases. China and the U.S. have the lowest standard deviations, reflecting the relative stability of their accrual rates over time. 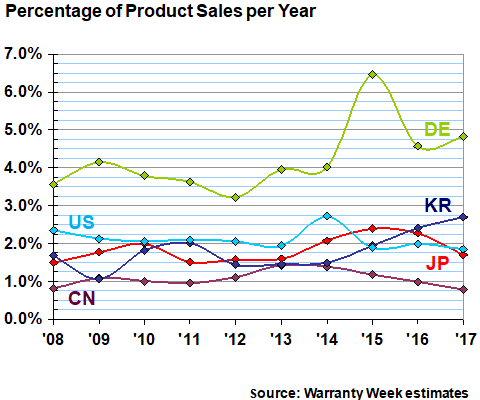 However, the only country that seems to have warranty data with a downward slope as is found in Figure 1 is China, and J.D. Power didn't include China. Therefore, once again with warranty accrual data, we cannot find any evidence of a decline to match the reported decrease in problems per 100 vehicles. Now, let's turn to a slightly different metric, collected by a consumer magazine from its readers. 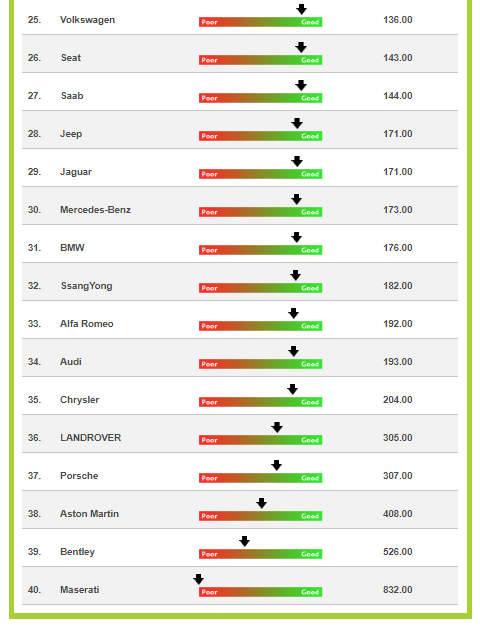 On October 24, Consumer Reports published an article entitled, "Who Makes the Most Reliable Cars?" From the looks of the data in the table below, the answer is the Japanese, followed by the Koreans and Germans. And though the question isn't asked, the answer for anyone wondering who's at the bottom of the chart is, it's primarily the American brands. For its survey results, Consumer Reports collected data from some 500,000 readers. In this case, the higher the number, the better. Once again, the data is collected from U.S. car buyers, so Chinese models are largely absent from the results. Also, Consumer Reports treats Jeep, Dodge, and Chrysler as domestic U.S. brands, and counts Audi and Mini separately from VW and BMW. Our warranty data is for each entire parent company on a worldwide basis, so we can't get down to the brand level. 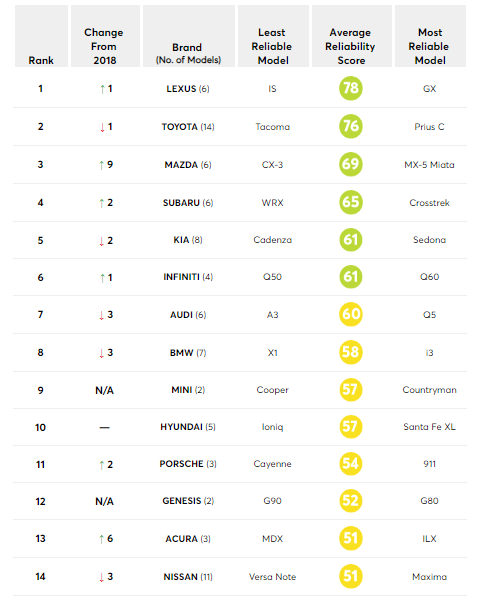 However, what the Consumer Reports data suggests is that the companies based in Japan, Korea, and Germany make the most reliable cars. Our warranty data suggests that if that's true, then the Germans are less efficient in terms of warranty expenses, because they pay more for comparable levels of reliability. So far, nobody has come up with an answer to why the China-based manufacturers always have the lowest warranty costs, except for one reader who said it's probably because their accounting principles are ... shall we say less stringent? Or maybe they do make the best cars in the world? Or maybe they do have the most efficient warranty processes in the world? Inquiring minds want to know. 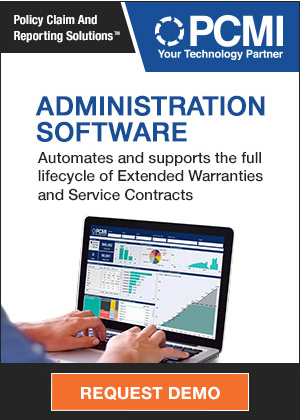 Finally, Warranty Direct Ltd., a British administrator of vehicle service contracts, maintains its own manufacturer reliability database, which is based on the real-world claims records of its 50,000 VSC policy holders. Once again, the Japanese take up many of the top slots, but a variety of European luxury and sports brands are at the bottom of this chart. Daihatsu, the most reliable brand on the chart, is a reference to Daihatsu Motor Company Ltd., which is now owned by Toyota. Ironically, sales of Daihatsu models have now ceased in Europe, but their legend apparently lives on. The only remotely Chinese brands on the list are MG and Volvo Cars. MG Motor UK Ltd., the venerable British racing car manufacturer descended from Morris Garages, is actually now a subsidiary of the Shanghai-based SAIC Motor Corp. Ltd. And Volvo Cars is now owned by the Zhejiang Geely Holding Group Company Ltd., better known as Geely, which is based southwest of Shanghai. Hyundai, at 14th, and Kia, at 20th, are in this case in the middle of the pack, rather than at the top, as they were in the J.D. Power and Consumer Reports surveys. By the way, SsangYong, listed 32nd out of 40, is a reference to another Korean manufacturer called SsangYong Motor Company, which is majority-owned by a conglomerate called Mahindra & Mahindra Ltd., which is based in Mumbai, India. We don't have good enough warranty data for the French brands to allow a reliable comparison with the other countries. 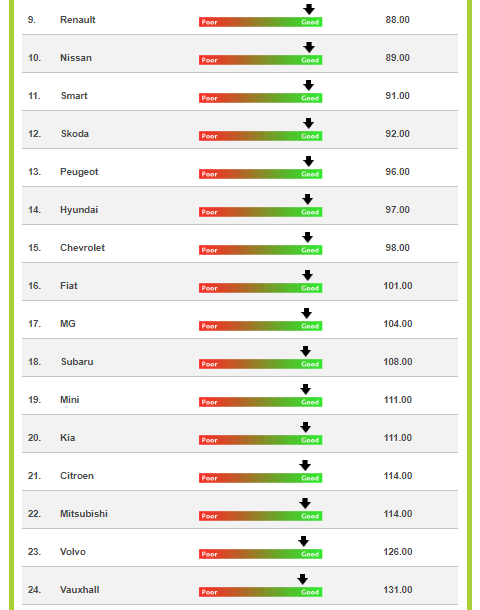 However, we note that in this Warranty Direct chart, Renault is ahead of Nissan, and Peugeot is ahead of Hyundai. Citroen is just behind Kia. It just goes to show that, as we said, there's apparently no correlation between warranty expense rates and quality or reliability ratings. We suspect that part of the reason is what is being measured. Incidents per 100 vehicles might correlate to the number of claims, but it says nothing about the average cost per claim. Magazine surveys depend on the emotions of readers who participate. The Warranty Direct index seems to account for both the frequency and severity of repair costs, so it should be analogous to warranty costs as a percentage of revenue. 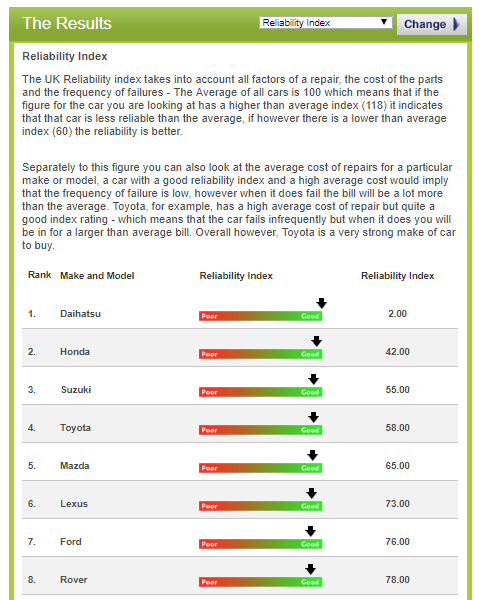 In fact, it states, "Toyota, for example, has a high average cost of repair but quite a good index rating -- which means that the car fails infrequently but when it does you will be in for a larger than average repair bill." However, extended warranty providers typically see cars at a different age than the initial period when they're covered by their factory warranties. And, no insult to the quality of British roads, but European drivers are not using their vehicles with the same frequency or severity as Americans do. And the British are able to buy numerous brands, especially sports models, that don't have a large U.S. presence. So even the repair indexes of U.S.-based VSC administrators, if they were ever published, would probably be very different from top to bottom. Overall, the lack of a consensus among these various data sets supports the idea that there is no simple correlation between high levels of warranty cost and low quality or reliability. Low warranty costs do not always imply high product quality. When it comes to warranty costs, wome companies are more efficient than others, even if they have similar reliability ratings. What makes more sense is to measure the long-term average and then look for major deviations from that baseline, which suggest improving or deteriorating conditions. Genstar Capital acquires 2-10 Home Buyers Warranty. Frontdoor and American Home Shield profiled as investments. Faberge offers to lengthen watch warranties to 10 years. YC Rubber lengthens casing warranty on Duraturn TBR tires from 5 to 6 years. Renters run into trouble with Sears water heater warranty. After, Inc. releases warranty analytics industry whitepaper. Endurance to be vehicle protection provider for the Andretti racing team. OnPoint Warranty Solutions raises $3 million. Should you get AppleCare+ for your Mac mini? AppleCare+ for new iPad Pro models priced at $130. Apple hikes iPad Pro out-of-warranty replacement costs by $50. Sears promises to fix broken refrigerator within two weeks, but doesn't. GE sets aside $240 million for wind turbine blade warranty costs. Alpha Warranty Services listed as one of Utah's fastest-growing companies. Judge rejects challenge to GM's dealer warranty surcharge. Dell initially denies claim, says unsold laptops have a shelf life. Future of Sears is in doubt over terms of DIP loans. SuperKlean Washdown Products lengthens warranties to 3-to-5 years. Sears bankruptcy puts Kenmore lifetime warranty in question. BMW profit warning partly blamed on rising warranty provisions. Are manufacturer add-on warranties good for dealers? Certified pre-owned vs. extended warranties/service contracts. Alpha Warranty Services appoints new President and Chief Operating Officer. Huawei warns U.S. consumers about warranty on gray market phones. House Method home warranty survey cites fear of high repair costs. Lawsuit filed against e-scooter companies Lime, Bird, Xiaomi, and Segway. What could happen to your Kenmore warranty now that Sears is in bankruptcy? Volkswagen Golf gets 6-year/72,000-mile warranty for 2018. Expert says Sears extended warranties may be in jeopardy. Consider an extended warranty plan if you buy a Surface Pro 6. Mark Williams Enterprises offers 2-year warranty for 11-inch gears. Bidders likely to make offers to buy Domestic & General this week. Apple has system to detect fake parts and serial numbers on iPhones. Airbus lengthens warranty on H145 Arriel 2E engines from 2 to 3 years. Encompass to provide pool and spa parts to repair technicians. TV station details complaints against Delta Auto Protect. GM to sell 5 or 6-year transferable bumper-to-bumper extended warranties. GM offers extended warranties as its reliability ratings improve. Car Care Council produces video about warranties and consumer rights. Roland DGA celebrates 37th birthday with 37-month warranties. The tale of the unrepairable KitchenAid fridge. Sears will continue to honor warranties, for now. Sears files for bankruptcy; Eddie Lampert steps down as CEO. Volkswagen Australia moves to 5-year unlimited distance warranties. Razer lengthens warranty on gaming products from 1 to 2 years. Survey of 50 companies finds 90% void warranties after independent repairs. Understanding your credit card's extended warranty benefit. Torrot GasGas NA selects Mize warranty management software. What happens to Sears warranties if the store goes bankrupt? Rampant Chinese iPhone repair fraud forced Apple to develop countermeasures. Opponents of E15 fuel say it could damage engines and void warranties. Road warranties become an issue in the Michigan governor's race. Why some credit cards are cutting extended warranty benefits. Jerr-Dan offers enhanced product warranty program. Home Depot refunds lawn mower cost after reporter intervenes. General Motors sues Johnson Controls over $28M in warranty claims. Munich Re and eDriving offer warranty on fleet crash reduction program. AmazonBasics mattresses cost less but have shorter warranties. Warranty to cover cost of fixing Transbay Transit Center's cracked steel beams. Apple loses warranty-related tax appeal in India. Schindler fined for not fixing passenger elevator in India. LG V40 ThinQ smartphone to carry the option of a 2-year warranty. HomeServe USA celebrates 15 years in business. Yves Gaboriault joins commercial risk management firm Alexander & Preston. Volkswagen temporarily adds 5-year warranties in Australia. PB Tech fined $77,000 for warranty breaches in New Zealand. Regulators investigate a company called Secure Home Warranty. OnPoint Warranty partners with Mize.